She's back! From New Line Cinema comes Annabelle 2, with David F. Sandberg (Lights Out) helming the follow up to 2014's hugely successful Annabelle, which scared up nearly $257 million at the worldwide box office during its run in theaters. The new film is once again being produced by Peter Safran and James Wan, who also partnered so effectively on The Conjuring movies. Today, we have a new look at dear little Annabelle in a just released photo. She is seen sitting on a bed with Talitha Bateman, who stars as Janice. Janice is obviously concerned that her new playmate is sitting straight up on the bed, looking as mischievous as ever. What did Annabelle do that has poor Ms. Bateman all riled up? We'll have to wait until this summer to find out! 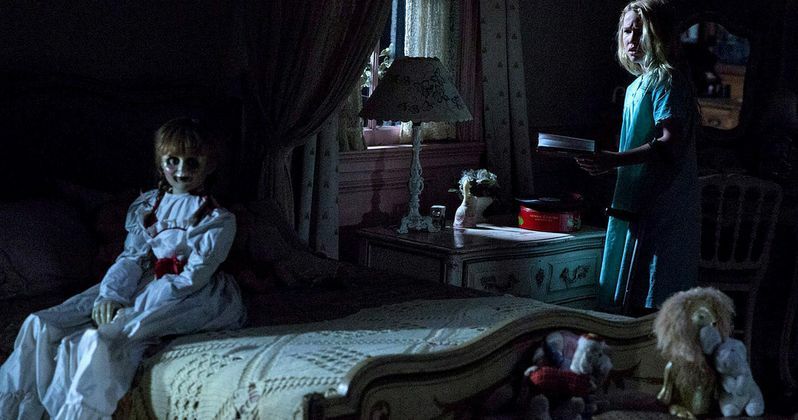 In Annabelle 2, several years after the tragic death of their little girl, a dollmaker and his wife welcome a nun and several girls from a shuttered orphanage into their home, soon becoming the target of the dollmaker's possessed creation, Annabelle. Sandberg directs from a screenplay by Gary Dauberman, who also wrote Annabelle. The film stars Stephanie Sigman (Spectre), Talitha Bateman (The 5th Wave), Lulu Wilson (Ouija 2, Deliver Us from Evil), Philippa Coulthard (After the Dark), Grace Fulton (Badland), Lou Lou Safran (The Choice), Samara Lee (Foxcatcher, The Last Witch Hunter), Tayler Buck in her feature film debut, with Anthony LaPaglia (TV's Without a Trace) and Miranda Otto (Showtime's Homeland, The Lord of the Rings Trilogy). Serving as executive producers on Annabelle 2 are Toby Emmerich, Richard Brener, Walter Hamada, Dave Neustadter and Hans Ritter. Collaborating with Sandberg behind-the-scenes from his Lights Out team are production designer Jennifer Spence, editor Michel Aller and composer Benjamin Wallfisch; they are joined by director of photography Maxime Alexandre (The Other Side of the Door) and costume designer Leah Butler (Paranormal Activity 3 & 4). New Line Cinema moved Annabelle 2 to August 11, 2017, where it only faces Edgar Wright's action comedy Baby Driver, starring Jon Hamm and Jamie Foxx. With it's limited budget and built-in audience raring to go, Annabelle 2 could be one of the last big blockbusters of the summer. It opens just one week after the animated comedy The Emoji Movie, and its only competition in its second week is All I See is You. Right now, we're looking at one of the weakest August release slates in recent memory, with Annabelle poised to rule the entire month. The original Annabelle was one of the most profitable movies of 2014, pulling in $84.2 million domestically and $172.6 million internationally for $256.8 million worldwide, from just a $6.5 million budget. We'll have to wait and see if the sequel will be as profitable as its predecessor. Annabelle 2 is a New Line Cinema presentation, an Atomic Monster/Safran Company production. The film will be distributed by Warner Bros. Pictures, a Warner Bros. Entertainment Company. Take a look as Annabelle gets ready to strike back.